The ultimate guide for brands to get the best from their agencies. Developing great ad campaigns is all too often left to serendipity rather than design, but no longer. 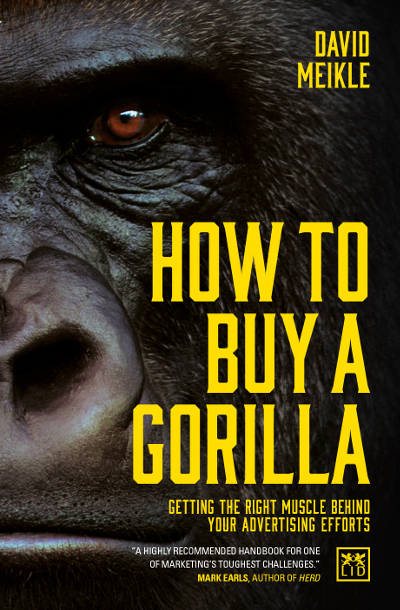 How to Buy a Gorilla shines a critical, objective light on the common flaws in the relationships between marketers, their procurement colleagues and their agencies. It provides an actionable set of principles all parties can use to resolve their differences and create greater value for the advertiser. Whether a market leader or a new challenger brand, How to Buy a Gorilla illustrates how a brand can find the right agency with the right talent and create the optimal conditions to solve its business problems. Using case studies, anecdotes, business models and a little dry wit, How to Buy a Gorilla provides the key to getting advertising that really packs a punch. David is a business and marketing consultant and strategist, specilasing in advertising agency performance management; agency sourcing and selection; marketing process and design and marketing procurement. Before founding Salt Partners in 2009, David had a career in advertising spanning more than two decades.